Austal is an Australian-based global ship building company and defence prime contractor that specialises in the design, construction and support of defence and commercial vessels. Austal's product range includes naval vessels, high-speed passenger and vehicle ferries and specialist utility vessels such as offshore windfarm and crew transfer vessels. Austal has three major ship building facilities. Defence vessels are designed and constructed in Henderson, Western Australia and Mobile, Alabama. Commercial vessels are constructed in Balamban, Philippines. Vessel support is provided through service centres located in Darwin, Cairns and Henderson in Australia; San Diego, California; Balamban, Philippines and Muscat, Oman. Corporate headquarters are co-located at Austal's Australian ship building facility in Henderson. As of early 2017,[update] Austal has designed and constructed over 260 vessels for numerous defence forces and commercial fleet operators. Customers include the Australian Border Force, Condor Ferries, Mols Linien of Denmark, the Royal Australian Navy, the Royal Navy of Oman and the United States Navy. LCS-2 was the first ship built by Austal USA for the US Navy and the Navy's first trimaran Littoral Combat Ship. It is the first naval warship constructed in Mobile, Alabama since World War II. The basis of Austal's seaframe design was the 127-metre (417 ft) trimaran hull HSC Benchijigua Express. The second Austal/General Dynamics ship, LCS-4, was cancelled on 1 November 2007. On 1 May 2009, the US Navy renewed the contract with Austal/General Dynamics to build the second LCS, the USS Coronado, with delivery scheduled for May 2012. On 29 December 2010 the US Navy announced a new contract with Austal USA after Austal severed ties with General Dynamics Bath Iron Works. New contracts for Littoral Combat Ships were awarded to both Austal USA and Lockheed Martin. The contract called for one ship to be built beginning in 2010 (the USS Jackson), one to be built in 2011 (the USS Montgomery), and two per year from 2012 to 2015. The LCS-6 contract was for US$432 million, with a goal of having the average ship cost US$352 million each. Another US$20 million was figured in for change orders, and a management reserve. In November 2008, Austal was awarded a contract to design and build the US military's next-generation, high-speed catamaran, the Spearhead-class Expeditionary Fast Transport (EPF), which was formerly called the Joint High Speed Vessel (JHSV). The contract was part of a larger programme potentially worth over US$1.6 billion. As the prime contractor, Austal was to design and construct the first 103-metre (338 ft) EPF, with options for nine additional vessels expected to be exercised between 2009 and 2013. Construction on the second ship started in September 2010. By the end of 2010, Austal had contracts for three ships, long-lead material contracts for two ships and options for five further ships, for a total of ten. The EPF is similar to the Austal-built MV WestPac Express, which the US Marines had used since 2002. The EPF can carry 635 tonnes (700 short tons), 1,200 nautical miles (2,200 km; 1,400 mi) at an average speed of 35 knots (65 km/h; 40 mph) and is able to unload at roll-on/roll-off discharge facilities. The vessels are 103 m (338 ft) long, have a 28.5 m (94 ft) beam with a crew of 22 to 40. The first four vessels were named USNS Spearhead, USNS Choctaw County, USNS Millinocket and USNS Fall River. While the EPF can carry 300 Marines and their gear for up to four days, it is not expected to be survivable against enemy attack. In 2011, US Navy planners envisioned building up to two dozen of the EPF ships into the 2020s. Austal was awarded the contract for the design, construction and through-life support of the Cape class patrol boats for the Australian Customs and Border Protection Service in August 2011. The eight, 58-metre (190 ft) aluminium monohulls were delivered between March 2013 and August 2015. Austal announced it has entered into a shipbuilding contract with the National Australia Bank to construct two further Cape Class Patrol Boats on 13 December 2015. The contract value is A$63 million. The two vessels will be delivered to the National Australia Bank in mid-2017 and subsequently chartered to the Commonwealth of Australia for a minimum term of three years. Austal did a similar off-balance-sheet charter with the MV Westpac Express, which was chartered to the US Navy for 13 years. 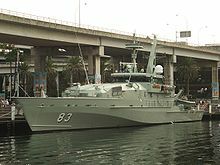 Between June 2005 and February 2008, Austal delivered fourteen, 56.8 m (186 ft) Armidale class patrol boats to the Royal Australian Navy for coastal defence. The boats were featured on the TV series Sea Patrol. In 2009 the Maritime Squadron of the Armed Forces of Malta ordered four patrol boats from Austal. They were due to replace the Swift-class patrol boats P23 and P24 which had been in commission since 1971 and the Bremse-class patrol boat P32 which had been in commission since 1992. The new vessels were built to Maltese specifications and were partly financed by the European Union. The first two vessels were launched in October 2009. All four vessels were delivered to Malta in late 2009, and officially commissioned on 18 March 2010. In 2005 Austal delivered ten high-speed patrol boats to the Yemeni Navy, which are commercially hired out to protect private shippers. In early 2014, Austal announced it had been awarded a US$124.9 million contract for two High Speed Support Vessels (HSSV) for the Royal Navy of Oman. Both were delivered to the Omani Navy by late 2016. The HSSV has a catamaran hull design similar to the US Navy's Expeditionary Fast Transport (EPF). The MS Villum Clausen was built and delivered in 2000 to Bornholmstrafikken on the Danish island of Bornholm. Austal is one of only two companies building fast multi-hull ferries between 60 m (200 ft) and 120 m (390 ft) long. 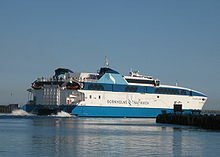 In the early 1990s the ferry industry was transformed with the introduction of large, high-speed catamarans with decks for vehicles. They quickly replaced most hydrofoil and hovercraft services as well as many monohull ferries. The popularity of the new type of multi-hull design led to many shipyards worldwide changing their production to build fast aluminium catamarans. Eventually capacity exceeded demand and by the end of the 20th century most builders of large fast cats had ceased production. However Austal and its only competitor in this category, Hobart based Incat survived the late 90s industry collapse and the two companies continue to compete for orders of large multi-hull ferries of up to 11,000 Gross tons with capacities of over 1,200 passengers and 400 vehicles. On 20 August 2014, Austal announced the sale of Austal Hull 270, the company’s 102-metre (335 ft) trimaran stock vessel, to the UK Channel Islands’ ferry operator, Condor Ferries, for A$61.5 million, and was renamed the HSC Condor Liberation. Additionally, modifications to the stock vessel were valued at approximately A$6 million, and was scheduled to enter service in Spring 2015. On 28 March 2015, the ship struck the quayside while attempting to dock in Guernsey on its second day in service. The damage was only minor and above the waterline. Since then, the Liberation has had a difficult period of operation with Condor Ferries, encountering numerous technical problems, weather cancellations and sustaining further damage to its hull whilst docked in Poole on 30 December 2015. ^ "Happy 30th Birthday Austal". Austal USA. 8 August 2018. Archived from the original on 16 August 2018. Retrieved 16 August 2018. Austal Limited started as a small, private shipyard in Perth, Western Australia on August 8, 1988. ^ "Austal Commences Construction of 109 metre High Speed Ferry for Molslinjen of Denmark". Austal. 26 April 2017. Archived from the original (Press release) on 9 May 2017. Retrieved 9 May 2017. [...] the plate cutting ceremony which was hosted by Austal Chairman John Rothwell and Chief Executive Officer David Singleton. ^ "Growth, Profitability, and Financial Ratios for Austal Ltd (AUTLF)". Morningstar, Inc. Retrieved 20 September 2017. ^ "Service Centres". Austal. Archived from the original on 1 April 2017. Retrieved 8 May 2017. ^ "Our Customers". Austal. Archived from the original on 1 April 2017. Retrieved 9 May 2017. Austal has designed and constructed over 260 vessels for over 100 clients in 50 countries, since 1988. Our customers include [...] commercial and defence fleet operators [such as] the U.S. Navy, Australian Border Force and Condor Ferries. ^ "Navy Christens Littoral Combat Ship Independence". U.S. Department of Defense. 10 January 2008. ^ "U.S.Navy Press Release No. 1269-07" (Press release). 1 November 2007. Archived from the original on 4 November 2007. Retrieved 1 November 2007. ^ "Navy orders second LCS from Austal". ^ "Austal Celebrates Keel Laying for JHSV2 – the "Choctaw County"" (Press release). Austal. 8 November 2011. Archived from the original on 3 April 2012. Retrieved 11 November 2011. ^ "Expansion of Cape Class Program" (Press release). Austal. 13 December 2015. Retrieved 15 December 2015. ^ "Visit to Australia by Republic of Malta Deputy Prime Minister and Minister of Foreign Affairs The Hon Dr Tonio Borg" (Press release). Australian Government - Department of Foreign Affairs. Retrieved 17 April 2009. ^ ""Excellent Relationship" Sees Rapid Patrol Boat Construction" (Press release). Austal. 3 July 2009. Archived from the original on 3 September 2014. Retrieved 15 October 2009. ^ "New AFM patrol boats launched". Times of Malta. 6 October 2009. Retrieved 15 October 2009. ^ "Austal Launches Maltese Patrol Boats" (Press release). Austal. 6 October 2009. Archived from the original on 3 September 2014. Retrieved 15 October 2009. ^ "Patrol boats to be commissioned on Thursday". Times of Malta. 16 March 2010. Retrieved 29 August 2014. ^ ""Austal to Build 10 Naval Patrol Boats for Yemen."". Archived from the original on 20 November 2010. Retrieved 17 November 2010. ^ "Oman receives second HSSV as Austal targets UAE". Jane's 360. 9 September 2016. Archived from the original on 11 September 2016. Retrieved 9 May 2017. The Royal Navy of Oman has received the second High Speed Support Vessel (HSSV) from Australian shipbuilder Austal. ^ "Sale of Stock Boat "Austal Hull 270", and Customisation Contract Award" (Press release). Archived from the original on 26 August 2014. Retrieved 24 August 2014. Wikimedia Commons has media related to Austal. This page was last edited on 4 November 2018, at 05:18 (UTC).